Back up Camera Runs thru GPS with (2) Side Bullet Cameras that are operated with the turn signals. Interior Lights in Storage Compartments. Roof Hatch for Roof Access. 19” Fold down TV with DVD Player. AV Connection Point for Gaming Equipment. 360 Degree UHF/ VHF TV Antenna w Power Amp. Mud Room Walls are covered with White Aluminum Sheeting for easy Cleaning. Pocket Door Separates Mud Room from Coach. Independent Heating & AC Ducts. Coach Floor is a “Super Sandwich” – Galvanized Vapor Barrier over a 2” Steel square Tubing Frame. Floor is insulated with Rigid Insulation, then topped with ¾” Ply Wood. (2) 8-D Batteries for Coach. 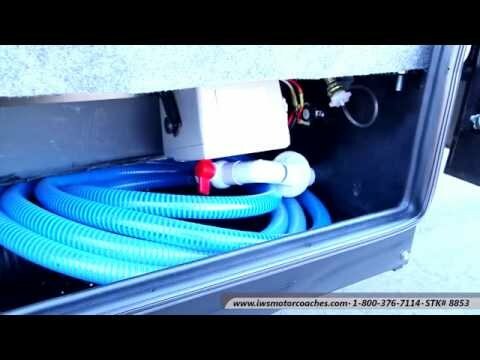 Additional 30 amp Outlet at Rear of Coach for AC Trailer Power.